High Potency Inter Cellular (IC). Aloe enriched. Straightens, shines, protects. 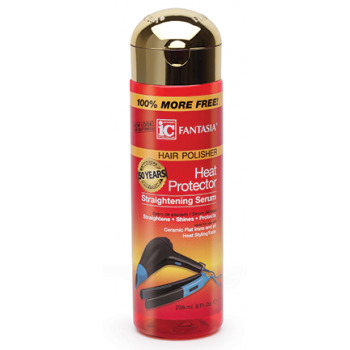 Ideal for use with ceramic flat irons and all heat styling tools. Enriched with Silicone, Aloe, Vitamin E & Sunscreen. Straightens, smoothes and protects hair from heat damage caused by hot tools. Vitamin E and Silicone seal in moisture, leaving hair silky smooth, frizz free with great shine, even in damp, humid conditions.